When preparing fish you want to be sure that the fish is handled properly to ensure it is safe to eat. There are several cooking methods that include baking, frying, and grilling, which all result in a little different taste for the fish when it is done cooking. 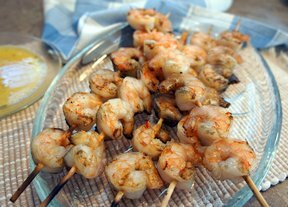 There is a countless number of fish and seafood recipes for appetizers, salads, entrées, and grilled entrées that you will enjoy preparing for friends and family. The fish cooking times will vary according to the size and type of fish. A fish is a cold-blooded, backboned, aquatic animal and there are many types of fish that live in every region of the world. Fish are harvested for their highly nutritious meat and for the oil that is extracted and used as a food product or as an ingredient for a wide variety of commercially prepared products. There are numerous fresh water and salt-water fish species that are harvested throughout the world. Some of these species are shown below. A type of scaleless, freshwater river fish distinguished by the whisker-like barbels that extend from its mouth. It is very popular because of its mild taste and because of the limited number of bones. It is easily poached, baked or fried. A small freshwater fish that is similar to a brown trout. It has an excellent flavor, but they are hard to find in most food stores and fish markets. The average weight is about one pound or less, but some may be double that. The grayling does not keep very well after it is caught, so it must be eaten as soon as possible. It is best when broiled or grilled. A fresh water fish in the pike family of fish. It is the smallest of the pike family, ranging from two to three pounds. It is a lean, low-fat fish with firm white flesh when cooked. A fresh water fish that is found in the Great Lakes and other large lakes in the upper United States and Canada. It is a family of fish, which includes the pickerel, pike and muskellunge. The pickerel is the smallest, averaging 1 1/2 to 3 pounds, the pike ranging form 3 to 10 pounds, and the large muskellunge, generally referred to as muskie, ranging from 10 to 35 pounds. Muskellunges have gotten as big as 60 pounds. The pike is known for its lean, low fat, firm flesh, which is yellow when raw but flaky white when cooked. One disadvantage of the pike is that it is bony. Pike is available fresh or frozen, and whole or in fillets or steaks. Pike can be prepared by most any cooking method. A freshwater fish with a firm textured flesh that has medium to high fat content. It is one of the most popular varieties of trout throughout the world. Most commercially raised Rainbow trout average 8 ounces but they can grow up to 50 pounds. Rainbow trout can be found fresh and frozen, whole and in fillets, and is generally fried when cooked. They can also be grilled, broiled, baked, steamed and poached. A North American freshwater fish, which consists of many varieties that are noted for their unique shapes and brilliant colors. The varieties include white and black crappies, and several types of bass, such as largemouth, smallmouth, redeye, rock, and spotted. A name used to refer to several species of warm, freshwater fish that are commonly bred in commercial operations to be processed for food. Although, Tilapia is a freshwater fish, it is also found living in saltwater. They cannot survive in water less than 60°F. Tilapia grown in warmer waters will often reach a weight of 3 to 4 pounds, while the majority produced for food in commercial ponds will weigh approximately 2 pounds or more. Since they reproduce well and can be raised in controlled ponds, they can be processed faster, brought to market quicker and provide fresher meat than other varieties that require longer harvesting, processing and distribution time. While the outer flesh may range in color from black with white shading to pinkish-red, the meat of this fish is white, firm in texture and mildly sweet in flavor, very similar to catfish. It can be prepared by baking, broiling, grilling, frying, poaching, or steaming. A round freshwater fish, which is found worldwide. There are several varieties of trout, including rainbow, brook, and lake. Rainbow trout, known for the pinkish red stripe on its sides, is the most popular variety with American consumers. The flesh of trout ranges from white to pink or orange in color and has a mildly rich taste and a tender, flaky texture. Trout is moderately lean and can be prepared by frying, broiling, grilling, or baking. It can be found fresh or frozen and is most often sold whole. If not available, salmon or whitefish can be substituted. A type of freshwater fish that is not a pike at all, but is a member of the perch family. Walleyed Pike has firm, flaky flesh that is mildly flavored and is suitable for many cooking methods including baking, frying, broiling, grilling, and poaching. It is found mainly in freshwater lakes of the northern United States and adjoining areas of Canada. A type of fish related to the salmon that is found in bodies of fresh water in North America. The flesh has a mild flavor, but it has a high fat content. 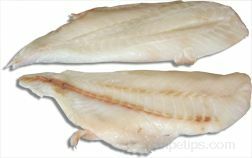 Whitefish is suitable for baking, frying, grilling, broiling, and poaching. A species of fish living in slow flowing rivers, lakes and ponds, which are sought as both a sport and food fish. Although the Zander may grow to a weight of over 20 pounds and is prized as a good fighting fish, it is generally caught for use as a food source ranging in weight from 4 to 8 pounds. Similar in appearance and flavor to a Walleye, the Zander provides a firm white meat that flakes nicely when cooked. Most common in Europe where it is also known as the Pikeperch, this fish is often baked, fried or grilled and then served as a main dish or as a meat ingredient for salads. Migratory fish mature in salt water but migrate to fresh water to spawn. A type of fish that is characterized by a smooth, snakelike body. They are found in fresh water rivers and lakes in Europe and North America, but migrate to the southwestern Atlantic for spawning. The flavorful meat of the eel is popular in Europe and is especially popular in Japan and other Asian countries. It is not as popular in the United States even though it was a favorite among people during colonial times. An anadromous fish, which means that the fish was born in freshwater, then migrates to saltwater to mature and then returns to freshwater to spawn. Popular to serve as a main dish, Salmon provides a tender, flaky-textured meat with a mild to rich flavor, depending on the species. It is a fish that is rich in omega-3 fatty acids, which help to reduce LDL (bad) cholesterol. Salmon can be prepared in most any manner, such as smoked, baked, broiled, grilled, fried, or poached. Salmon originated in the Atlantic and Pacific Oceans but are now grown in most locations where there is cold, protected seawater. The largest member of the herring family, it has a slight oiliness to it and a mildly sweet flavor that resembles pompano and salmon. Shad is an anadromous fish, which means that it is born in freshwater and then migrates to saltwater to mature and then returns to freshwater to spawn. This fish is hard to fillet because of its many small bones so it may be desirable to purchase it already filleted, otherwise, it can be steamed or baked at a low temperature for more than six hours, until the bones disintegrate. Female shad is more in demand than male because they are fatter and larger, and because they contain the desired roe. An anadromous fish, meaning it matures in saltwater but migrates to freshwater to spawn. It is a very small silver colored fish, which has a tint of green coloring on its back. The best season for smelt generally starts in September and runs into May. They are generally found ranging in size over 3 inches to under 8 inches. Smelt are sold, cooked and eaten whole. They have a rich, oily flesh with a mild flavor. They are highly perishable so if they are not to be eaten immediately after they are caught, they are quickly frozen. A lean saltwater fish with flesh that is tender, white, and mildly sweet. The striped bass is a saltwater fish that migrates to fresh water to spawn. 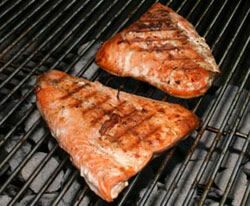 It is a versatile fish that can be prepared in many ways, but when grilling, it is best to place the fish in a fish basket because it does not hold together well. Trout, grouper, snapper, or monkfish can be used for substitutes if striped bass is not available. Striped bass is also known as "rockfish." An anadromous fish, meaning it matures in saltwater, but migrates to fresh water to spawn. It averages in weight at 55 to 60 pounds, but some specimens grow much larger. The fish roe from the sturgeon is considered the "true caviar" and is probably more important than its flesh. The sturgeon has a rich, high fat flesh that is very firm, similar to meat, and is delicately flavored. On a limited basis, fresh sturgeon is available whole (less than eight pounds), or cut into steaks or chunks. Most of the sturgeon caught in U.S. waters is smoked. A saltwater fish that is a member of the cod family and sometimes referred to as bigeye pollock or walleye pollock. It has a slender body that is olive green to brownish in color on its back and its sides are silvery. Its flesh is firm and white which flakes nice when cooked. The Alaska Pollock should not be confused with the Atlantic Pollock, which is more oily with a darker flesh that has a fishier taste. Alaska Pollock is great for baking, broiling, sautéing, frying, steaming, or poaching. It is the most widely used fish in the fast food market where it is used to make fish n' chip fillets, fish patties for sandwiches, and ground fish products. Alaska Pollock fillets are also delicious enough to be served in a nice restaurant. 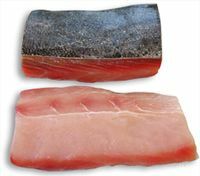 A large quantity of the Alaska Pollock that is harvested today is the used to make surimi, which is imitation seafood. A small saltwater fish belonging to the herring family that is native to the Mediterranean Sea and the English Channel. Typically no more than 6 inches in length, the anchovy is green colored as a fresh fish, but changes to a grayish black color when cured. Similar to a sardine in size, this fish is used often in the same way as a sardine, being served in appetizers or as an ingredient to season and garnish a variety of foods, such as salads, soups, pasta, or pizza. Anchovies are processed into filets and preserved by curing them in salt and packing in olive oil, by pickling the filets in vinegar and oil (referred to as "boquerones" in Spain), or by preserving the filets as fresh fish. When cured, they become dark black in color and salty in flavor. Anchovies packed fresh in oil (olive or sunflower) and wine vinegar are referred to as white anchovies, retaining more of their white silvery color. White anchovies are fresher in age, more perishable and may not last long after being purchased. The white anchovy filets however, provide less of the salty taste present with salt cured anchovies. A common type of saltwater fish that has flaky white meat and a mild taste. It is one of the most popular types of fish and is used in many processed fish products, such as fish sticks or fish cakes. It is also a variety of fish that is often blended with other types of white fish to produce the fish stick products or other food items containing fish. Haddock and hake make good substitutions for cod. A saltwater fish that has flaky white flesh when cooked and a mild flavor. It is one of the varieties of flatfish that are characterized by their flat oval bodies, horizontal swimming style, and eyes that are on one side of their head. If flounder is not available, other flatfish varieties including sole, halibut, dabs, and plaices can be substituted. A type of flatfish that is a member of the flounder family. The skin on the top side is grayish brown to black with the underside white, typical of flatfish which lay on their underside and have two eyes on their top side or left side when considered in a vertical, rather than flat position. Ranging in size from 3 to 5 pounds, fluke is available as a whole fresh fish or in fillets. The fillets will weigh from several ounces to a pound each, with the skin removed. The meat is white and can be broiled or baked. The fillet meat on the topside or dark side is always thicker than the meat on the bottom side or light side. The flesh is smooth, white and firm in texture, which cooks nicely and flakes easily. The fluke is also known as a summer flounder, a flattie, and a lefteye flounder. A similar type of fish from the same family is the winter flounder that is considered a right-eyed fish. Like the fluke, this fish has similar textured meat that is flavorful and good for baking or broiling. An ocean fish that commonly jumps out of the water and glides airborne over the surface for a distance of 10 to 20 feet. Small in size (12 to 15 inches generally), the Flying Fish has large oversized pectoral fins and a split tail with a larger surface area on the lower tail section than on the upper tail section. Some species have both large pectoral fins and smaller pelvic fins that serve to enable longer gliding distances. The meat of the Flying Fish is firm, tender and white in color, providing a good tasting meat that can be baked, fried, grilled, steamed, or served in stews. It is best to eat Flying Fish soon after they have been caught, since they do not keep well for shipping long distances. A fish found in the warm waters of the Atlantic, Gulf of Mexico, and Caribbean, belonging to the sea bass family. They may weigh as much as several hundred pounds, but the average weight caught for commercial use is 15 pounds or less. Grouper have a firm white flesh when cooked and are suitable for boiling, poaching, or baking. The strong tasting skin should be removed before the fish is cooked. A white fish found in the colder waters of northern oceans that is very much like cod, but is smaller. It may be used in any other recipe that calls for white fish such as cod or flounder. Haddock can be used in recipes that require the fish to be fried, baked, poached, or broiled. A saltwater whitefish that has, mildly flavored, flaky flesh. The most desirable halibut with the best flavor usually weigh less than 10 pounds. Halibut is a member of the flatfish family and can be used as a substitution in recipes that require other types of flatfish such as flounder and sole. A member of the Grouper family of ocean fish, Hapuka is large fish that reaches 4 to 5 feet in length. Thick-bodied, the Hapuka has an outer skin that can vary from silver and blue to a pink, brown and silver combination. Most often found in deep waters, this fish is common in the waters around New Zealand and Australia. Filets from the Hapuka are firm, white, very flavorful, and somewhat similar to a bass. The Hapuka may also be referred to as a Hapuku or a New Zealand grouper. A type of saltwater fish found in the colder waters of the North Atlantic. There are many varieties of herring and most of them grow to no more than a foot in length. They are sold fresh, smoked, packed in salt, or pickled. A fish with delicious, mildly flavored meat that is native to Europe. The excellent flavor and texture of the John Dory are in direct opposition to its appearance. It has a flat, curved shaped body and an unusual looking head that is large and spiny. Pan-frying, baking, broiling, and grilling are some of the cooking methods used to prepare the fish. A variety of the mackerel fish family, which are members of the tuna family. It is most often found in warmer ocean waters, such as from the Carolina coast in the U.S. to Brazil in South America. This fish is favored as a game fish, because of its fight and size that may range up to 100 pounds. Similar to other species of Mackerel, this fish has an oily, soft, pale flesh, that is sometimes pink, which when cooked, becomes flaky and firm with an off-white color. The rich flavor will vary according to the oiliness of the fish, which changes with the seasons and with different species, but the flavor is often compared to the Atlantic mackerel. Steaks or fillets of mackerel are available fresh or frozen and can be substituted with tuna, marlin, or swordfish in many cases. This species may also be referred to as king mackerels or kings. This type of mackerel is often confused with another species named Kingfish, which is a member of the drum family of fish. There is a southern kingfish and a northern kingfish, both drum species, which are not related to the tuna or mackerel family. A saltwater game fish from the North Pacific. The lingcod has lean, flaky white meat that is mild flavored and is available in fresh or frozen fillets. To check the fish for doneness, use the tip of a sharp knife and cut through the thickest part of the fillet. If the fish has been properly cooked, the meat will appear opaque but will still be moist. A saltwater fish, related to the tuna, with an oily, soft, pale flesh, that is sometimes pink, which when cooked, becomes flaky and firm with an off-white color. The rich flavor will vary according to the oiliness of the fish, which varies with the seasons and with different species. Steaks or fillets of mackerel are available fresh or frozen and can be substituted with tuna, marlin, or swordfish in many cases. A warm water fish that has a medium textured dark flesh that turns brown when cooked. It has a good flavored flesh, but it is high in fat content. Mahi Mahi is easy to prepare by grilling or broiling and is a good alternative to swordfish. To check the fish for doneness, use the tip of a sharp knife and cut through the thickest part of the fillet. If the fish has been properly cooked, the meat will appear opaque but will still be moist. This fish is also known as Dorado (the Spanish name) or Dolphinfish. One of the many species of shark, it is found in the moderate and tropical waters of the Atlantic and Pacific oceans and can grow to be 1000 pounds within a period of five to six years. Mako sharks must be bleed out immediately after catching and put on ice. The shark's blood contains urea, which breaks down to ammonia after the fish dies. This can give the shark meat an ammonia taste and smell. Mako shark is a fairly inexpensive fish with ivory-pink meat that has a dense texture, a mild flavor and contains a moderate amount of fat. Often compared to swordfish, its flavor is enhanced with the addition of spicy flavoring when cooking. If not available, most recipes can have the Mako shark substituted with a meaty fish, such as tuna, catfish, marlin and swordfish. When selecting Mako shark, smell the fish first to determine if there is an aroma of ammonia. If the ammonia smell is slight, the meat should be alright, but if it has a strong ammonia aroma, the fish should not be purchased. A slight ammonia smell can be eliminated by soaking the fish in an acidic solution of water and lemon juice or vinegar. Cover the fish with cold water and add 1/2 teaspoon of lemon juice or one tablespoon of vinegar for each pound of shark you are soaking. Allow the shark to soak in the refrigerator for at least 4 hours. When the ammonia smell is strong, it is an indication that the shark was not properly handle when first caught, has not been properly stored, or that it is no longer fresh. Soaking the shark at this point will not eliminate the ammonia smell or taste. A strange-looking fish that is firm textured and has delicious tasting meat, similar to that of lobster. In Europe, the monkfish has been treasured for many years, but until the later part of the 1970's, American fisherman would dispose of the monkfish. Americans now keep the monkfish, but only for the meat from the tail, whereas Europeans use the entire fish. It can be prepared using several different cooking methods, such as poaching, roasting, sautéing, or grilling. If monkfish is not available, it may be substituted with grouper, tilefish, or lobster. When cleaning, be sure the fish is thoroughly skinned, paying particular attention to the center ridge. Skin remaining on the ridge will cause the fish to be tough when cooked. A firm textured fish that has both white and dark meat which provides a somewhat nutty flavor. One of the most popular species for food dishes are the striped or silver mullets. In the Southern U.S., the flesh and roe of the mullet are both very popular, but most of the roe harvested in the U.S. goes to Taiwan and the Middle East. As with most fish, mullet can be baked, broiled, grilled, fried, and poached. A type of rockfish found along the North Atlantic coasts of North America and Europe. Their coloring is a bright orange-red and they can weigh up to 5 pounds but are most often 1 1/2 to 2 pounds when caught for market. 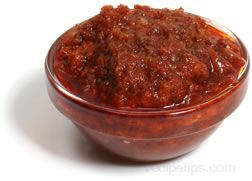 Its flesh has a mild sweet flavor and medium firm texture. The larger Ocean Perch have a coarser texture. Generally ocean perch are quite tender and can be used in any recipe that calls for a white fleshed fish. Ocean Perch is also referred to as Rosefish or Redfish. It should not be confused with the Redfish found in the Gulf of Mexico, which are a member of the drum family. A low-fat saltwater fish from New Zealand and Australia that has a white flesh with a firm, moist texture and a mild sweet taste. Orange roughy can be prepared by baking, steaming, broiling, frying or poaching. A lean fish with a coarse texture and delicate flavor, consisting of a large family of fish found in temperate and tropical waters all over the world. Porgy has a lot of small bones, so when selecting, it is best to buy larger specimens because they have a better meat to bone ratio, making the bones easier to remove. Also known as sea bream or scup. A low-fat fish that is a member of the drum family, found along the southeastern coast of the United States and in the Gulf of Mexico. Smaller redfish, weighing less than ten pounds, have a sweet, mild flavor and a moist flaky texture. Larger fish have a tendency to have a coarser flesh. This fish is also known as red drum, channel bass, spottail bass, red bass and puppy drum. If redfish is not available, other members of the drum family can most often be used, such as black drum, or weakfish. A fish that is not actually a mullet but a member of the goatfish family. It has mild flavored, firm white meat and few bones. Characteristic of other goatfish, the red mullet has long chin barbels that look like the whiskers on a goat, which they use to locate food. 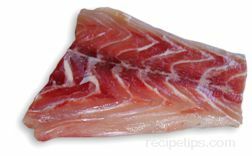 Sea bass or trout can be used as a substitution for red mullet. A lean, round saltwater fish with flaky white flesh which has a firm, moist texture and a mild, sweet flavor. It can be prepared by broiling, baking, steaming or poaching. Halibut, trout or whitefish may be used as a substitution in most recipes. A lean saltwater fish that has a white flaky flesh and a mild taste. It is available in fresh or frozen fillets. A small, young, saltwater fish with soft edible bones, found in the Mediterranean. There is other small, young saltwater fish found that are called sardines but they are not true sardines, such as the Pacific and Atlantic herring, blueback herring and sprat. The sardine is a silver color and has a rich flavored flesh that is dark colored. Fresh sardines should be put on ice immediately and eaten as soon as possible, but in the United States they are hard to find fresh. They are generally found canned in olive oil, soy oil or water. Sardines are popular as an appetizer and are good broiled or grilled. A young codfish, which is a round saltwater fish. Its meat has a tender, flaky texture with a mild flavor. Scrod can be prepared using several methods, such as baking, steaming, broiling and poaching. If scrod is not available, substitute halibut or haddock. A round saltwater fish that is moderately lean and has a moist, flaky textured flesh. It has a sweet, mild flavor and can be broiled, baked or fried. Sea trout is also known as "weakfish" and can be substituted by cod, haddock or bluefish if necessary. A fish that is a member of the porgy family, which is only found in the Atlantic Ocean. Its profile and teeth structure resemble that of a sheep. The flesh of this porgy has a firm, flaky texture with a sweet flavor. The sheepshead porgy is no relation to the sheepshead found in the Pacific Ocean or the freshwater drum, which is known as sheepshead. Tilefish or black drum can be used as a substitute for sheepshead porgy. A saltwater fish, belonging to the ray species of fish, which is found in temperate waters throughout the world. It is part of the ray family and is related to the shark. Skate has a flat body with triangle-shaped wings on each side of its body. The wings, which are the pectoral fins, are the edible, boneless meat of the fish. Mildly sweet in flavor, the meat is semi-firm texture and although it appears to be somewhat layered or partitioned, it does hold together well when cooked or sautéed. When preparing, occasionally the skate meat will emit a smell similar to ammonia. 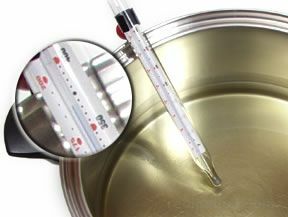 This odor, which will not affect the meat, can be removed by soaking the meat in an acidulated water bath for a short period of time. If not available, catfish, shark (same family as skate) or sturgeon can be substituted. A saltwater fish that consists of many species. Some of the common species are red snapper, gray snapper, yellowtail snapper, and mutton snapper. The most popular species is the red snapper, which is known for its red eyes and dark pink skin. The red snapper has lean flesh that has a firm texture. Smaller snapper is available whole, but the larger fish are generally only available in steaks or fillets. Snapper can be prepared using almost any cooking method including frying, broiling, grilling, baking, steaming, and poaching. A saltwater fish found in the Atlantic off the U.S. and European coasts. There are five species found in the Atlantic waters near the U.S., but none are particularly good for eating. The best-known sole for eating, Dover sole, is in the Atlantic near Europe. It has lean, white flesh with a delicate flavor and firm, flaky texture. There are other edible species found in Europe, but none is as popular as the Dover sole. 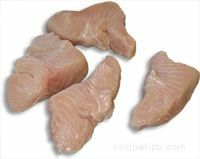 It is generally available in fillets, which are fresh or frozen. Sole is suitable for frying, broiling, baking, or poaching. Flounder, plaice, or whitefish can be substituted if sole is not available. A popular saltwater fish found in warm and tropical waters. The fish's upper jaw resembles a sword and is about a third of its length. They can grow to be as much as 1000 pounds but are generally caught before reaching 250 pounds. The moderately lean flesh of the swordfish may be white, orange or pink, but when cooked they all turn the same color and have the same mild flavor and meaty texture. Fresh swordfish is available from late spring through most of the summer. It is available frozen throughout the year. Swordfish is good when broiled, baked, grilled, steamed or poached. A saltwater fish found in tropical or moderately temperate waters throughout the world. They feed on mollusks, crab, shrimp, and squid and can be as small as 2 pounds and as large as 50 pounds. It has white, low-fat flesh with a firm texture and a mildly rich flavor resembling lobster and codfish. Tilefish can be found fresh or frozen, and in fillets or steaks. The smaller fish are also available whole. Baking, broiling, grilling, frying, steaming, and poaching are suitable methods for cooking tilefish. A saltwater fish found in temperate and tropical waters worldwide. The flesh is tender and flaky with a meat like texture and is very flavorful. Some species of tuna will grow to be 1500 pounds, but fresh tuna sold at market will generally not weigh more than 150 pounds. Tuna is sold fresh or frozen, in fillets and steaks, which can be cooked by broiling, baking, steaming, or poaching. Canned tuna is commercially available, packed in water or oil. A round saltwater fish that is moderately lean and has a moist, flaky textured flesh. It has a sweet, mild flavor and can be broiled, baked or fried. Weakfish is also known as "sea trout" and can be substituted by cod, haddock or bluefish if necessary. "Excellent resource to expand my knowledge of fish and how to cook them. Thank you!" "Imsscott, you may be technically right but in our part of the country many of us refer to walleyes as walleye pike. I don't know what the restaurants do with the name and substitutions but if you mention walleye pikes around here no one would think anything of it. Anyway, I enjoyed the information on this page. I love to fish and am always interested in information on any type of fish." "It is northern pike, not pike, and it is walleye, not walleye pike or walleyed pike as you have it. Walleye pike was a name used on restaurant menus in the past so that they could freely substitute either northern pike or walleye depending on what they had available that day." "Some of the fish showed in the Type of Fish Tips was new to me, so it's a big help and a great opportunity to know other fish like walleye pike and so on...keep it up!" "It sure is nice to be able to get all this information on one page."